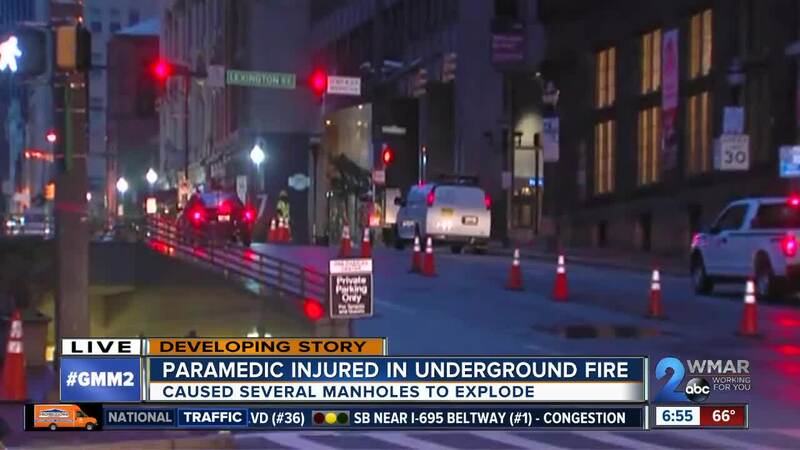 A paramedic is injured after an underground transformer caught fire, causing at least four manholes to explode. Baltimore City Fire officials say the incident occurred at N. Charles and E. Lexington Streets in Downtown. Catherine Kozakevich, lives at an apartment complex near that intersection. She described how the incident unfolded. "We were standing across the street and saw black smoke coming from under the apartment. I don't know what was going on underground and then we saw a big explosion, like fire from underground and everybody starts running away." Baltimore City Fire personnel have cleared the scene and the fire was brought under control around 9:20 p.m. on Monday. Linda Foy, a Senior Manager of Communications with BGE, says the incident was caused by an underground electric cable that was damaged by steam. BGE has transferred service to customers being fed by that cable to another underground cable, so they can remove the damaged cable and replace it. Foy continued to say the steam issue is that's Baltimore City's issue, not theirs. Surrounding buildings have been evacuated, and have had their power turned off. Baltimore's Office of Emergency Management was urging people to avoid the area. East Saratoga and East Fayette Streets were closed between North Charles and Light Streets. The injuries sustained by the paramedic are believed to be non-life threatening. The incident isn't the first of its kind in Downtown Baltimore. Similar incidents happened in February and June of this year.